I apologize for getting to this post so late, but life has been ultra hectic following the half marathon, and between running, furniture shopping, packing and having our final walk-through (squee! ), I haven't had a lot of time on my hands for blogging! I left Kenosha Saturday morning after the Wisconsin Half Marathon a little conflicted. 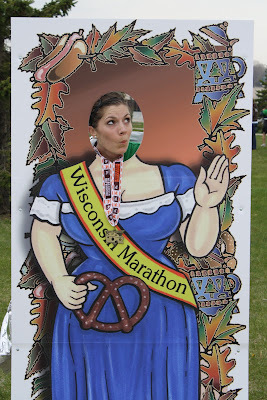 On one hand, I ran a smart race (just like I'd hoped! ), felt incredibly strong throughout (even at the end) and really, truly enjoyed myself and the course. On the other hand, I missed achieving a PR. I missed it by SEVEN SECONDS. Throughout much of the race, I was feeling so great, so full of energy, I thought for sure I'd PR - maybe by a couple of minutes. I had one goofy mile, around mile 8, that threw off my average pace by a few seconds, and that put me behind. Knowing I was so close to getting that personal record (especially after a less-than-stellar training stretch) but falling behind by seven measly seconds was a little heartbreaking, but it really didn't affect me like I thought it would. Maybe I'm maturing, but the fact that I felt so strong, didn't really feel super tired until about 11.5 miles in, and was able to enjoy the course, the breeze from the lake and the perfect weather, all of those things combined felt better than a PR would have. At the Chicago Half, I felt absolutely horrible during the last four miles. I gave it everything I had and when I finished, I wasn't sure that I wanted to put myself through that again. 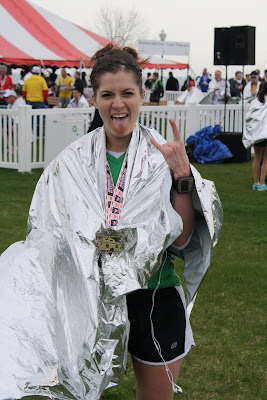 On Saturday, I finished feeling exhilarated, confident, strong and completely excited to sign up for my next race. I guess I could've pushed myself harder, I guess I could have picked it up a few seconds per mile for that PR. But it didn't happen that way. It wasn't a physical victory for me Saturday morning, but it was undoubtedly a mental victory. So, remember all those huge concerns I had going into the race? The weather? My shin injury? Stomach issues? Going out too fast? Well, the weather was spectacular for the majority of the race (clouds rolled in and it got chilly just as I was finishing), my shin did not hurt me AT ALL, my stomach behaved itself and I was uncharacteristically consistent in all of my splits (pace per mile) pretty much from start to finish - even picking up my pace in the last four miles. Sure, if any of these issues would have popped up, I guess I could make an excuse for falling short of a PR, but I'm happier that I didn't have to worry about a thing for 13.1 miles! I'm a naturally competitive person - especially in individual sports, like running. Since I began taking running seriously last spring, I've put too much pressure on myself to run faster or to be better. I worry that people won't think I'm fast. I obsess over stats: every split, every run, every lap on the track. I can get so caught up in following my Garmin that I forget the feeling of just feeling happy, free and so lucky to be out running. On Saturday, there was a long stretch of the race where I couldn't stop smiling - I was happier out there than I've been in a long time. 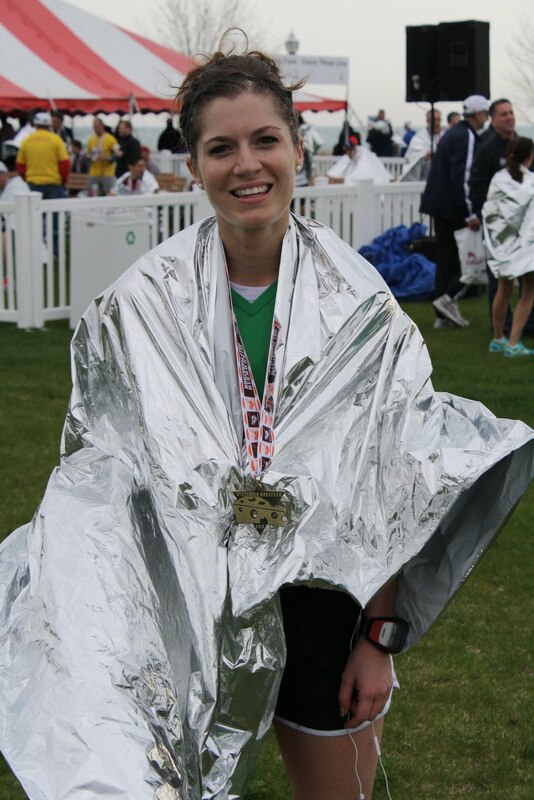 That feeling is the one that finally made me feel like a "runner," though I've been running for years. When I'm 85, I have a feeling I'll remember how I felt after this race, though I'm fairly sure my fastest official race time will escape me. I'm going to admit that I very creepily realized I was running right next to you all at one point and I almost asked if I could join you but chickened out because I didn't want to look like a crazy stalker! It would have been even *more* fun running with your group, though!